Dr Laumua Tunufa'i came to New Zealand from the small Samoan village of Afega in 1994. Originally studying a Bachelor of Arts in Theology and Philosophy, Laumua worked as a theologian for many years until 2001. He then came to AUT and began his "academic dream." Laumua graduated with a Master of Arts (Social Sciences) in 2005 and a Doctor of Philosophy in Criminology, in 2013. Laumua came to AUT because it was new, small and he believed it would be beneficial. He believes AUT is people-orientated and this is what makes it a great university and a great place to work. Laumua has a lot of experience working with youth around the Pacific, as a youth worker in Samoa, Papua New Guinea, New Zealand, and American Samoa. His passion for the Samoan youth in New Zealand, and seeing them succeed both academically and occupationally, is why Laumua conducted his research. Laumua says he is very proud of completing his PhD for his family. He is happy that he has the opportunity to complete more research at AUT as a lecturer in Social Science and Public Policy. Being from Samoa is very important to Laumua, especially in his role as a lecturer. He says he has a specific perspective which helps him to understand his students, and therefore to support them successfully through their studies. “I'm very passionate about our young people’s success. 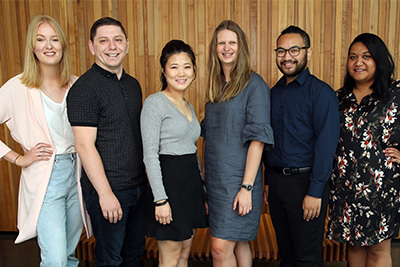 Many of these students are New Zealand-born and they have as much opportunity as any other New Zealander, irrespective of ethnic affiliation, to gain access to higher levels of academia and employment opportunities. I want to help them to believe that."